Less than a week ago, the Tampa Bay Lightning were dazzling. They were the best team the NHL had seen for a while. They had the goaltender. They had the scorers. They had depth and resiliency and consistency and grit and smarts. They came from behind. They rarely lost two in a row, and never three. Yet, here they are: Their backs to the wall, their heels on the cliff, their bodies bleed as they try desperately to avoid the final plunge to their finish. Matt Duchene and Oliver Bjorkstrand scored second period goals to lift the Jackets. Cam Atkinson added an empty netter. For the Lightning, Ondrej Palat scored in the third period. The Bolts played without Nikita Kucherov, who was suspended, and Victor Hedman, who was hurt. “I think you’re doing yourself a disservice if you’re going to look at the big picture," said Lightning coach Jon Cooper. "I do know there’s a lot of positive energy in that room after the third period. As down as the guys are about losing the game, and rightfully so, I think the guys liked how the game started to go in the second half. 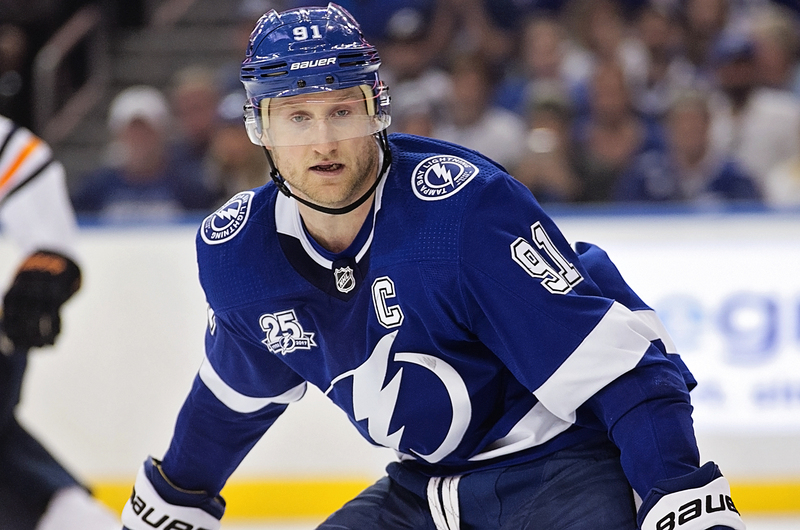 Steven Stamkos did not have a shot for the Lightning. He has yet to score a point in the series. “This was a game we really wanted," Stamkos said. "We stuck with it. We knew they were going to push hard in the beginning. Vasy made some big saves, kind of calmed the storm a little bit and gave ourselves a chance in the third. They’re defending well. We’re not getting any opportunities. We pushed hard in the third period hoping that at least we’d get one power play there after we got that goal. To have no power plays in a game is pretty surprising. You have to earn those and I thought we played well in the third but it’s no consolation right now with the position we’re in. Tyler Johnson said the Bolts still have fight in them. For the Lightning, focusing on the next step is more important than figuring out what has happened, Ryne McDonagh said. “I mean, it’s a lot to digest right now. If you look at the big picture, I don’t think that helps us. Our focus has to be coming out and playing with that same pace, that same execution and that same desperation right from the start, play one period at a time. The teams play again Thursday night. The Lightning can force the series back to Tampa with a win, but the Jackets can close them out if they win. The puck is scheduled to drop at 7 p.m. at Nationwide Arena. Spent three hours on the road today and listened to a national sports talk radio show (Dan Patrick) and not a single mention of this colossal implosion by the Bolts. Visited ESPN.com front page and not a work about the series. I’m just surprised that it doesn’t seem to be making big time news or a national topic of discussion. I’ve been surprised too. But it’s hockey, and it’s a team from Tampa Bay against a team from Columbus, and it’s in the first round. One word.. Shoot. This next game has to be scrappy, charging the nets looking for rebounds. Columbus has taken away the passing lanes so shoot at that goalie and if a defender is in the way shoot hard and make him think twice about blocking it again. This is a hard thing they have to do now. They have to win ugly. Ugly, pretty, whatever. They have to win four in a row. Yes, they’re talented enough, but I fear that Columbus can smell blood.